This biker couple is really cute! 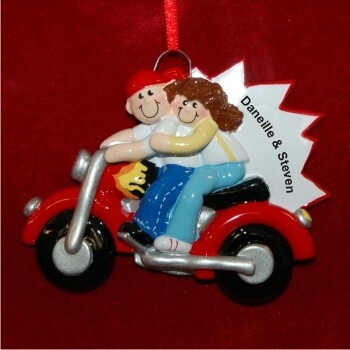 The couple on the motorcycle personalized Christmas ornament features a guy and gal astride a bike with classic style while they smile broadly and hit the road to happiness. These become couples ornaments personalized as wonderful mementos with the addition of a message from you along with the year. Compose your sentiment, and one of our lettering artists will hand paint it where shown, but in a very attractive, customized font. Surprise your biking partner or a couple you enjoy riding with by giving the couple on motorcycle Christmas ornament personalized and shipped in our classic velvet gift and storage bag.